When we consider that the most wrongly accused is Christ, we would receive injustice with joy. 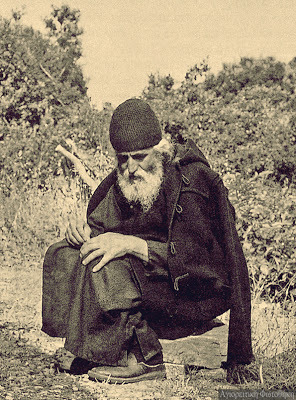 Though He was God, He came down to earth out of great love and was enclosed in the womb of the Panagia for nine months. Then, for thirty years He lived quietly. From fifteen to thirty He worked as a carpenter for the Jews. And what tools did they have then? They used wooden saws and wooden pegs. They would give Him some wooden boards, and say: "Make this, make that". And how did He plan them? He would plan using those gypsy-like irons, which were used then for planning. You know how tough they are? Then later, three years of hassle! Barefoot he would go here and there to preach. He would heal the sick, with mud He opened the eyes of the blind, and they would still ask for signs. He would remove demons from the possessed, but unfortunately the ungrateful people would say He had a demon! And though many had spoken and prophesied of Him, and He did so many miracles, eventually He was shamed and crucified. This is why the wrongly accused are the most beloved children of God. This is why those who have been wrongly accused have within their hearts the wrongly accused Christ, and rejoice in exile and in prison as if they are in Paradise, because wherever Christ is, there is Paradise. From Elder Paisios the Athonite: Spiritual Struggle, Book 3. Translated by John Sanidopoulos.